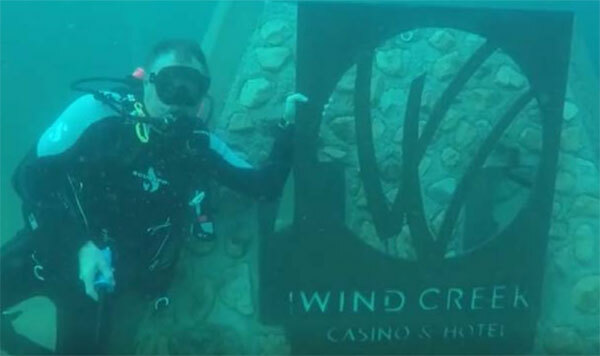 Wind Creek Reef: Pictured (left to right) are Poarch Creek Indian Tribal Council Member Dewitt Carter and Poarch Creek Indian Tribal Council Treasurer Eddie Tullis with the artificial reef sponsored by Wind Creek Hospitality. Photo courtesy of Gary Emerson. Orange Beach, Ala – August 2018 – Wind Creek Hospitality is the latest entity to partner with the Alabama Gulf Coast Reef & Restoration Foundation (AGCRRF) to expand recreational diving opportunities off Alabama’s Gulf Coast. Poseidon’s Playground sits three miles offshore, south of Perdido Pass (30° 14.070’N / 87° 31.522’W). The playground, which is now approximately an acre in size, was conceived by the foundation with the intention of creating a dive site that is accessible to a wide variety of divers of all ages and skill levels. Since the initial structures were deployed in late 2014, the foundation has worked with sponsors to add interesting, diverse structures to the playground. Recently, Wind Creek partnered with them and funded a new structure which was deployed earlier this month. “We are very grateful to have the support of Wind Creek Hospitality,” foundation President Vince Lucido said. “The company continues to be an outstanding corporate citizen, supporting important causes in our area. We are proud they have taken an interest in our efforts to promote and expand recreational diving opportunities here. Their contribution is making a lasting impact. Since its inception in 2012, the foundation has worked with corporate and public partners and the Alabama Department of Conservation & Natural Resources to deploy whole ships as well as to enhance existing reefs and reef zones. In addition, AGCFF promotes activities and events that support the sustainability of Alabama’s marine resources and the responsible use of those resources. Reef Deployed: The Wind Creek Hospitality Reef was recently deployed and is already being enjoyed by divers like this one captured by Captain Gary Emerson, AGCRR foundation board member. Photo courtesy of Gary Emerson. Combining the interests of divers, fishers and conservationists, the foundation and partners like Wind Creek Hospitality work toward preserving, sustaining and enhancing the habitat and water quality of the Gulf and supporting Alabama’s innovative artificial reef program. Wind Creek Hospitality is an authority of the Poarch Band of Creek Indians and manages the Tribe’s gaming facilities including Wind Creek Atmore, Wind Creek Wetumpka, Wind Creek Montgomery, Wa She Shu Casino in Nevada, Renaissance Aruba Resort & Casino and Renaissance Curacao Resort & Casino as well as racetracks in Alabama and Florida.